Not sure if it's a bug with the forums or not, but every time I cut/copy, then paste text into a reply it shows up as black if I preview or post it. 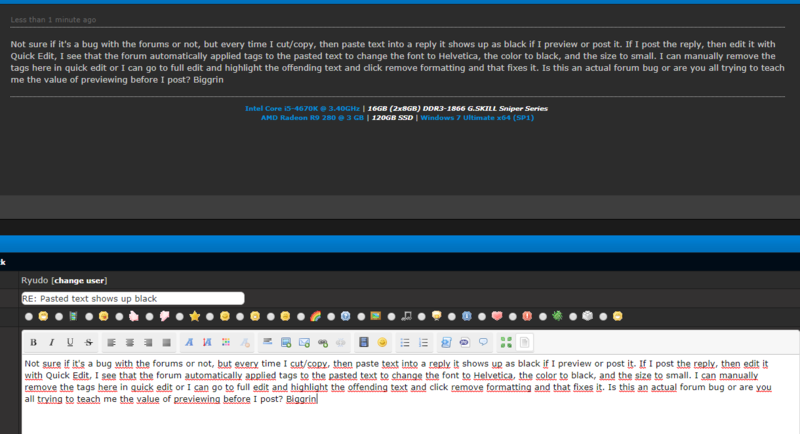 If I post the reply, then edit it with Quick Edit, I see that the forum automatically applied tags to the pasted text to change the font to Helvetica, the color to black, and the size to small. I can manually remove the tags here in quick edit or I can go to full edit and highlight the offending text and click remove formatting and that fixes it. Is this an actual forum bug or are you all trying to teach me the value of previewing before I post? Don't have the issue here. I don't have the issue either, what browse/addons are you using? Have you cleared browser cache? It works as intended because you're also copying the formatting. You need to select the text and click Remove formatting. (06-05-2018, 02:44 PM)lightningterror Wrote: It works as intended because you're also copying the formatting. I could understand that if I was copying it from another website or maybe some other outside source, but I was cutting and pasting from the very same text box while typing a reply so I would assume that the formatting should stay the same, right? ^ the above line of text was cut from the reply text box and then pasted back in. And to answer Akasha, I'm using MS Edge currently with uBlock Origin, LastPass, and Translator addons and I have the browser set to clear it's cache whenever I close it. I guess I could grab a portable version of Firefox or Opera and try it out and see if it just affects Edge. Edit: I tried out portable versions of Opera and Firefox and they both behaved as expected when cutting and pasting. It even worked correctly in IE11! I guess this is just a bug in MS Edge then. You still have to be careful because depending on the program you're copying from, it will try to copy source formatting. In many cases, this includes font colors, and can be as literal as this very text box I am typing in right now. Best you can do is, if it's an option when pasting, is use a "Paste Unformatted" option, use the Remove Formatting option in the post editor, or use a plain text editor to filter it out. My personal go-to for stripping formatting is Notepad++, I just pop it open, paste, select all, cut and close. Then I have true plain text ready to paste wherever. (06-06-2018, 03:56 AM)pandubz Wrote: You still have to be careful because depending on the program you're copying from, it will try to copy source formatting. In many cases, this includes font colors, and can be as literal as this very text box I am typing in right now. Best you can do is, if it's an option when pasting, is use a "Paste Unformatted" option, use the Remove Formatting option in the post editor, or use a plain text editor to filter it out. My personal go-to for stripping formatting is Notepad++, I just pop it open, paste, select all, cut and close. Then I have true plain text ready to paste wherever. Yeah, unfortunately Edge doesn't have a paste unformatted option. I didn't think to try pasting into a text editor first though. I'll have to give that a try next time. Thanks for the suggestion.